Anthony Crolla will return to the ring on 18 July for the first time since he suffered a fractured skull and broken ankle when confronting burglars. The 28-year-old from Manchester will fight for the WBA world lightweight title against Colombian Darleys Perez. The fight is on the undercard of Scott Quigg's WBA super-bantamweight title defence at the Manchester Arena. 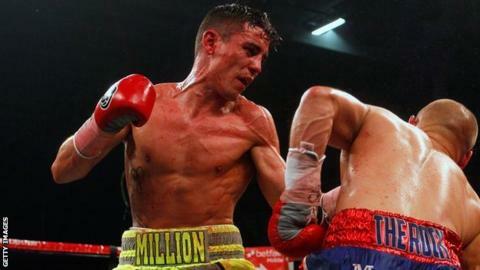 "It's amazing to be back and fighting for a title," said Crolla, who was due to compete for the belt in January. That plan - to fight Cuban Richar Abril - was derailed when Crolla was struck by a concrete slab when chasing burglars he had spotted leaving his neighbours' home. "Lying in my hospital bed after the attack, I didn't know what the future held - I was just lucky to be alive," said Crolla, who has won 29 of his 35 professional fights. "But I have worked so hard and had so much support that I have to win that world title. "Perez is a great fighter and I know I am going to have to be at my very best to beat him. But with everything that has happened, it feels like I am destined to win the belt." Promoter Eddie Hearn added: "When we got the news of Anthony's injuries it was touch and go whether he would fight again. "He has shown remarkable strength and bravery and I promised him I would deliver him a shot at the world title in his return." Perez, 31, has won 32 of his 33 fights and was made WBA champion after holder Abril twice pulled out of defences against Liverpool's Derry Mathews.